The wines brilliant deep purple-reddish hue leads to aromas filled with roses, cherry and blueberry with hints aromas of cinnamon toast and dark chocolate. A full entry to the palate with expressive black cherry and cocoa showcases silky, structured tannins supported by a long finish that will lengthen over time to a big balanced finish with ripe dark berry overtones. A medium to dark purple hue with a core of bright rich fruits, this wine exhibits the best of Napa Valley. A rich, sweet nose of violets, cherries and brown sugar capture an elegance of cabernet. On the attack, the rich vanilla and ripe black cherries frame spices of nutmeg, cinnamon and allspice. The finish is long with moderate, full tannins that linger on the palate with dark chocolate and coffee. This California Sauvignon Blanc begins with crisp yet soft Meyer lemon flavors and Crenshaw melon, then has a creamy mouth feel of mandarin oranges, yellow peaches and a touch of spice and finishes with ripe peach and citrus blossom. This multi-vineyard blend of different grape varietals creates a unique forum that is greater than any one grape standing alone. Take this insulated picnic basket/cooler to chill that perfect bottle of wine! Enjoy a day at the beach or in the park with this super comfy beach chair that folds up into a conveniently light over the shoulder bag! 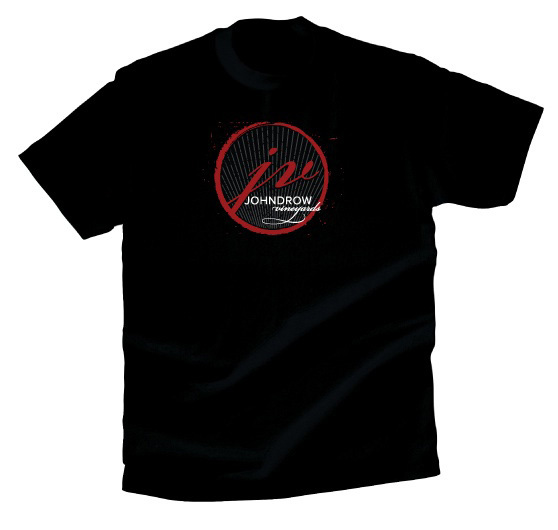 Sport a Johndrow Vineyards T-Shirt and Find Your Happy Place.